a fossil fuel power plant. The effect of such facilities on air quality in the South Bronx, where we have an asthma epidemic, is very concerning. Asthma rates in the South Bronx are eight times the national average; asthma deaths are three times the national average; and it is estimated that one in every five children in the South Bronx has asthma. 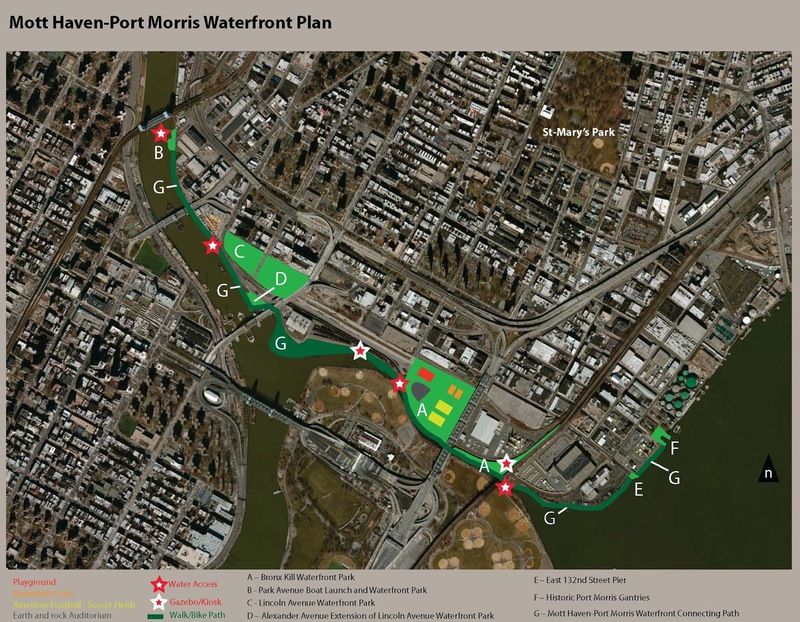 The Mott Haven-Port Morris Waterfront Plan would help offset this health crisis by providing designated open spaces on the waterfront for walking, running, boating and engaging in other sports activities. ConEd station during Hurricane Sandy. waterfront access and to create a vibrant 24/7 neighborhood by enhancing the pedestrian environment (transforming the area into a true “Gateway to the Bronx”). As a result of the rezoning, several multifamily buildings were renovated, additional warehouse spaces were converted to lofts and, notably, a 400+ residential unit was build (and is now occupied) directly across the street from Harlem River Yards. access from the South Bronx shore. 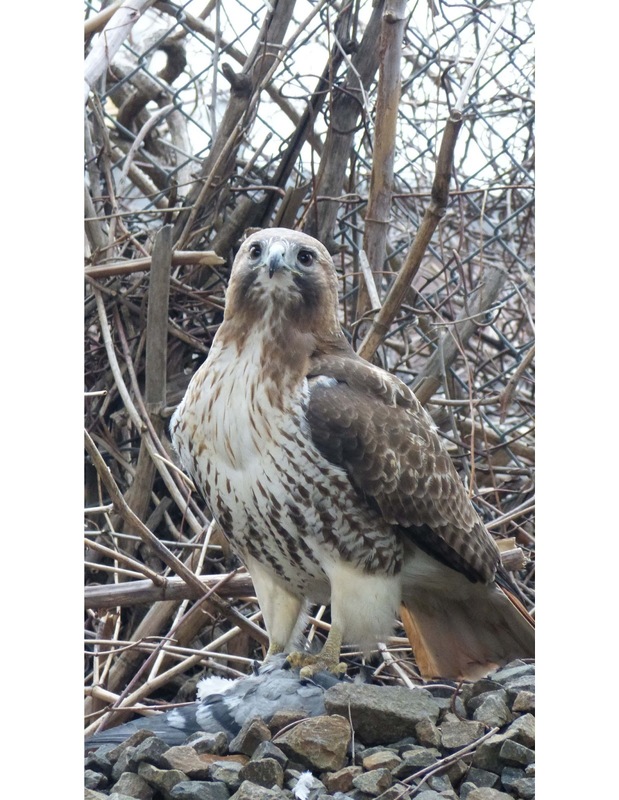 The Bronx Kill has also been included in Vision 2020 NYC Comprehensive Waterfront Plan as an area in which to explore improvements and support habitat restoration and, where feasible, the navigability of the Bronx Kill for kayaks and canoes. 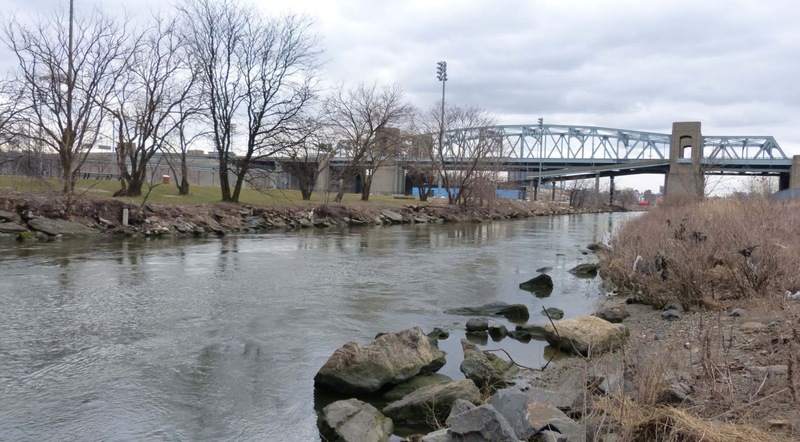 In addition to a boat launch, the Bronx Kill Waterfront Park has also been re-envisioned to contain a low-cost earth and rock auditorium as well as low cost soccer fields, basketball courts and a playground. The site would also contain a memorial to the Ranchaqua Native Americas, as historic evidence exists of a Ranchaqua settlement and burial ground on the site. 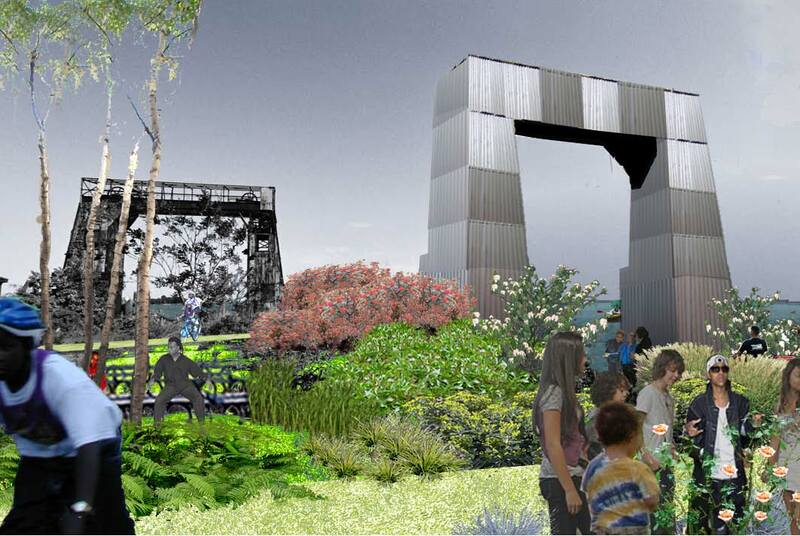 The southern extension of the Bronx Kill Waterfront Park would stretch along the coast line from St. Ann’s Avenue to the Hell’s Gate Bridge, directly connecting the park to the “Randall’s Island Connector”, a pedestrian and bicycle bridge connecting the South Bronx to Randall’s Island, which is scheduled for completion in 2013. This coastal site is also important because it is located in a Zone B flood zone of an SMIA and is adjacent to a fossil fuel power plant. This proposal can help mitigate the effects of climate change and potential flooding of industry and electrical infrastructure on the waterfront in the future. climate change on the waterfront in the future. It is also within an area proposed for elimination from the SMIA designation and is included in Vision 2020 NYC Comprehensive Waterfront Plan. eliminated from SMIA designation and is included in Vision 2020.
of industry and the waste transfer station on the waterfront in the future. Finally, this area was included in Vision 2020 NYC Comprehensive Waterfront Plan. it. It is already being used as an ad hoc fishing site. 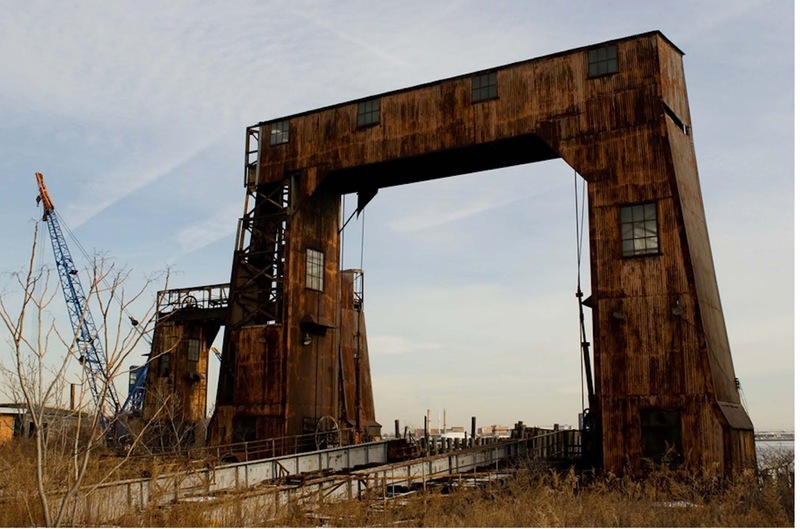 This coastal site is also important because it is located in a Zone B flood zone of an SMIA (which was impacted by Hurricane Sandy) and can help mitigate the effects of climate change and potential flooding of industry and electrical infrastructure on the waterfront in the future. Finally, this site was designated in the Vision 2020 NYC Comprehensive Waterfront Plan as an area of significance. Celebrate” program which identified projects on the basis of the architectural and historic merit of the area, the level of threat to the neighborhood, the strength and willingness of the local advocates and the potential for HDC’s preservation support to be meaningful. been operating ferries across the East River from various points since 1886. To capitalize on Port Morris’ inclusion in a network of communities serviced by ferry, a market, hotels, restaurants and stables were constructed nearby in 1905.
out of business. The New York and College Point Ferry Company went out of business in 1918, though not entirely due to its obsolescence. George Ehret, Sr., the company’s founder, was understood to have been a financial supporter of German causes and was in Germany at the onset of World War I. As a result of his decision to stay there, the United States government considered him an enemy alien and seized his assets, including the ferry company. From that point, the city controlled ferry operations from the site for transportation to city institutions located on Rikers, Welfare and North Brother Islands. In 1948, North Brother became home to Riverside Emergency Housing for World War II veterans and their families. To accommodate this new island traffic, the city upgraded the 134th Street ferry facility and constructed the ferry bridges that same year. The ferry bridges functioned as gangways to load passengers and vehicles onto the ferry boats and absorb some of the impact of boats entering the slip. In 1966, the ferry was discontinued and the Police Department began using the site as a marina. A one-story brick building was constructed for the Harbor Unit headquarters. Today the site is still owned by the city, but has been mostly unused since the 1990s. the Long Island Sound. Given its close proximity to power stations, this proposal would serve to offset the effects of waterfront storm surges on the power grid. Waterfront would benefit significantly from a bike/walk/run path along the entire shoreline from Park Avenue in the west to East 135th Street in the east which would connect the Park Avenue Boat Launch to the Lincoln Avenue Waterfront Park (extended by the Alexander Avenue Waterfront Park), which would lead to the open space adjoining the Bronx Kill waterway/boat launch and then continue to the East 132nd Street Pier and finally the Historic Port Morris Gantries. Providing connectivity between these vital waterfront access points in Mott Haven-Port Morris would assist in the success of each point. This coastal path is also important because it is located in a Zone B flood zone of an SMIA and can help mitigate the effects of climate change and potential flooding of industry and electrical infrastructure on the waterfront. i like this plan. hope to see more support and funding to be a viable alternative to Fresh Direct. How do we get this further up the flag pole..